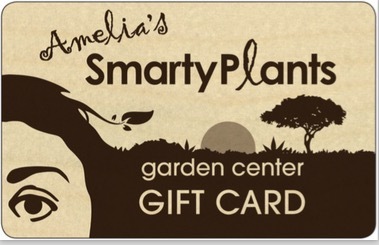 Welcome to Amelia's SmartyPlants Monthly Newsletter! Last month we observed Mother's Day; this month is Father's Day. Remember your Dad on Sunday June 16. I'm sure he'll say "a gift is not necessary", but you know one is nice. See section below for ideas. Rainy days of summer are here, and they are hugely welcome - not the heat but the rain. I remember the drought only 2 years ago, which you will agree was scary. Yes it's hot, but if you get new plants in the ground soon, they will quickly get established with the bountiful rain. Bugs are amazing - in a good and in a bad way. Somehow they find food, often the nice new tender growth in our beloved plants. Scale insects (Coccoidea) are particularly prolific this summer. 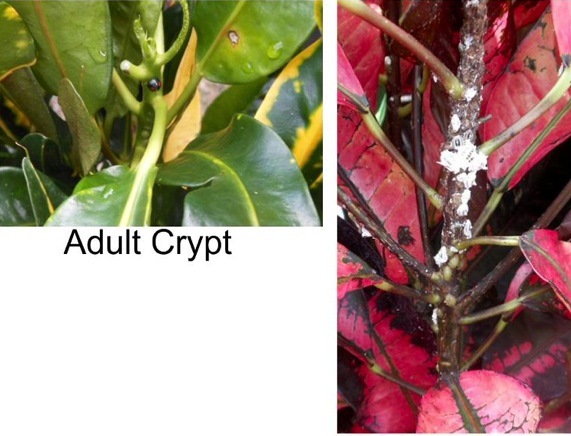 Scale can be hard (armored), soft, or be a mealybug. There are many types of scales, perhaps more than 8,000 of which approximately 250 can be found in South Florida - lucky us! Virtually every woody plant is susceptible to one or more species of scale. 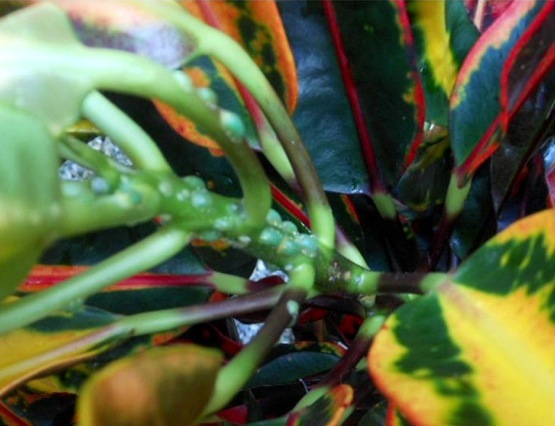 These insects cause damage by sucking the juices from the plant. They appear on leaves, branches, and trunks. Some of these insects, mainly the soft ones, produce a honeydew, which is an excellent medium for sooty mold to breed. Now you have scale and sooty mold. Early detection is imperative for effective and quick control. How do we get rid of these nasty critters? The hard scale is harder to control because the bug lives under a hard shell that is hard to penetrate. It's like a house that it builds and under which it lives. It is generally resistant to on-contact insecticides requiring systemic controls. On-contact insecticides, i.e., horticultural oils, are effective on soft scale and mealybugs and have the least effect on other non-target insects. Dead scale does not fall off the plant, so don't assume the scale is still alive because you see the bug. The dead ones will dry out; the live ones are juicy when squished - not my favorite thing to do. We know harmful insects find our plants on which to host, but on the flip side, beneficial insects find harmful insects on which to feed, preferably the scale on our plants (see first picture below). The other day, we found a whole army of Cryptolaemus (family of predatory beetles) larvae eating the scale on our Crotons. We did the happy dance; it was fun to watch them eat the scale on our plants, which they had somehow found. The pictures below are intended to show you what one species of scale, and what these beneficial creatures also look like to help you recognize them as "good bugs" and not destroy them. The young larvae, which feed on scale, look very similar to mealybugs. They are white, furry, and have elongated bodies. You can tell them apart from mealybugs because they move fast. you can actually see them eating the scale. The larvae develop into beetles that resemble ladybugs, which makes sense because they are in the ladybug group of beetles. The beetles don't eat scale; they lay the eggs that will eventually produce the larvae, our good friends, that eat the scale. Beneficial insects are an alternative to synthetic chemicals. You may be interested in ordering Cryptolaemus online, or if you have scale on your plants, they may find it all on their own. It's a fine balance because these insects need plenty of food so you have to have enough scale for them to consume, but you don't want to wait too long to start eradicating the pests. The longer you wait the more damage they will cause. Good-quality bronze or copper outdoor clocks, thermometers, rain gauges, or weather stations. Tools - we just received made-in-U.S.A. heavy-duty shovels for "real-men jobs"
Only for Father's Day weekend (Saturday and Sunday) - all weather instruments and weather stations are 30% off and all heady-duty shovels are 10% off. Chinese Perfume, Aglaia odorata, is a fairly new plant in the market. We are showcasing it as the Plant of the Month because it is a great choice for a slow growing, dark green, pest resistant hedge material for full or partial sun. It also makes a nice bush in the garden and is appropriate for container gardens. Its blooms are sweetly and mildly fragrant mostly in the evening. It can reach heights of 6 ft. but can be maintained shorter if desired. You can use hedge trimmers to maintain its size, but most plants always prefer to be trimmed using hand pruners so the leaves remain intact. We have it in 3-gal. and 7-gal. sizes. We have a few specials this month starting with Downy Jasmine (Jasmine pubescens or multiflorum) - This fast grower is ideal for covering large areas in the landscape. It can get large quickly - 6' x 6'; it grows laterally more than vertically as it sends long leaders to make the way. Most of the time, you will find beautiful 1-inch star-shaped blooms on it. It's hardy and drought-tolerant once established. This jasmine in 3-gal. containers is 20% off. 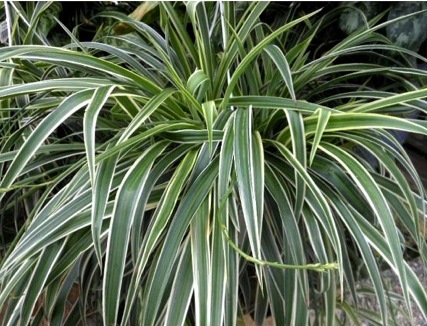 Spider Plants, chlorophytum comosum, are still believed to be one of the best air-cleaning plants available. They tolerate low light, so they make great house plants. They also don't require a lot of care or water, and they make lots of babies making the basket fuller and more beautiful. You can enjoy them as they grow bigger, or you can take the babies and make more plants for you or for your friends. Spider hanging baskets are 15% off this month. Your Dad may enjoy one of these hanging baskets. 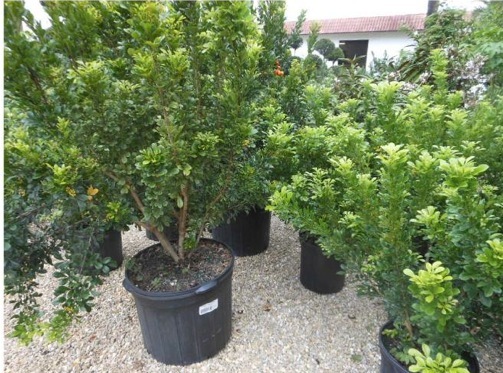 The last plant on sale this month is the Japanese Boxwood, Buxus microphylla 'Japonica'. This is also a slow grower and is perfect for short hedges. It likes full to partial sun, and is tough and drought tolerant once established. Prune with hedge trimmers or hand pruners. If you use hedge trimmers, trim only 2-3 times per year as to keep it full. Trimming often, like many maintenance companies tend to do, will promoting woody growth. We have 3-gal. and 7-gal. plants for 20% off. The larger plants will make an instant hedge. Bugs and weeds are a part of summer in Florida. If you stay ahead of both of them, your life will be easier in the long run. Once either one gets away from you, it is much harder to get things back under control. This rainy weather is great for our plants, but it's also great for weeds. They are plants too and they love the rain. So, catch them early. Same thing with bugs. They are easier to control when you have only a few. Speaking of weeds, please do not use Roundup near roses; the smallest amount of this herbicide will hurt them. Osmocote is the fertilizer of choice for roses. You can also use a rose-specific fertilizer in addition to Osmocote, but don't over fertilize as this will cause stress to your plant. Better to be light handed and fertilize more often than to be heavy handed and risk hurting them. The chili thrip loves roses, especially the undersides of the leaves and the new growth, causing curled brown leaves and the plant to decline. Use Spinosad to exterminate them. It does not work as a preventative. If you didn't do it yet, this is a good time to restake and remulch your rose bushes.